Bogdan, this stuff ROCKS. I was absolutely blown away. I’m doing a presentation at SQLPassCamp in Germany next week, and I’m showing some slides of this to show the attendees how your team is really on the cutting edge of BI in the cloud. Really great work. I’ll put together a more BI-oriented presentation in a week or two after I’ve played with it more. If there’s ever anything I can do to help, let me know! And have a great weekend! I just wanted you to let you know the application of TAT in academia. Our group (for computer network course) used to analyze bluetooth traces and how to utilize this information in delay tolerant networks (DTN). 1. We had large amount of data available (after processing) in csv format which could be easily opened in excel. 2. We were asked to derive inference on the traces that could be used in field of both DTN and social networks. Going through each trace manually is cumbersome and not feasible. 3. Four of my project members had no background in Data Mining and SQL Server. 4. Everyone had Excel installed on their machine. 5. They were reluctant to download SQL Server and install it just for one experiment. Also, they were not inclined to learn data mining as it was not their domain. So, TAT for cloud proved to be ideal fit. you might be interested to take a look at the collection of videos and tutorials on data mining using R.
you might as well check out the collection of videos and tutorials on Data- applied. you might as well check out the collection of videos and tutorials on WEKA. can i compare the effectiveness of two data mining algorithms i.e k-means and o clustering using cloud computing? What i’d like to know is other than the ease of use does Excel based mining provide anymore advantages? 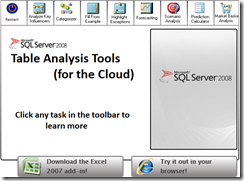 And how is the future like for Excel table analysis tool?